While going into year five of writing this year, it really began to hit me just how tough the filmmaking world is for 99.9% of people. More and more walls seem to be being built around breaking in by people who then stand by the gate expecting payment from others to get through. That’s not cool. I’ve also become more and more inspired by the likes of Richard “RB” Botto (Stage 32), Don Boose (Simply Scripts), Janet Goodman-Clarke (Simply Scripts: Shooting The Shorts), and Anthony Cawood (Creator of the free “You’ve Finished the Damned Script — Now What?” guides) who have created or helped create platforms for creatives to be discovered without the need for upfront payment. There are many others who inspire me too, but too many to list, you know who you are. You are truly the good guys. I want to be a part of that. I want to do something now rather than dream of doing something if I manage to break in, because I’ve come to the accept the latter may never actually happen. For some time now, I’ve been grumbling that creating and running a dedicated script listing site isn’t as expensive as some make out. I feel that having to pay up to $25 per month per script is nothing short of ridiculous. There are creatives out there who need that money to survive — I know, I’ve been there. Well, four weeks ago, I decided to bite the bullet and build something. I have to admit it’s been harder than I thought, working on this project between work and writing, but I finished the first release last weekend. Script Revolution is a script hosting website offering many of the features of the top script directories for free. Screenwriters can add and manage as many script listings as they want for zero cost. Filmmakers can browse the script listings as much as they need without charge. 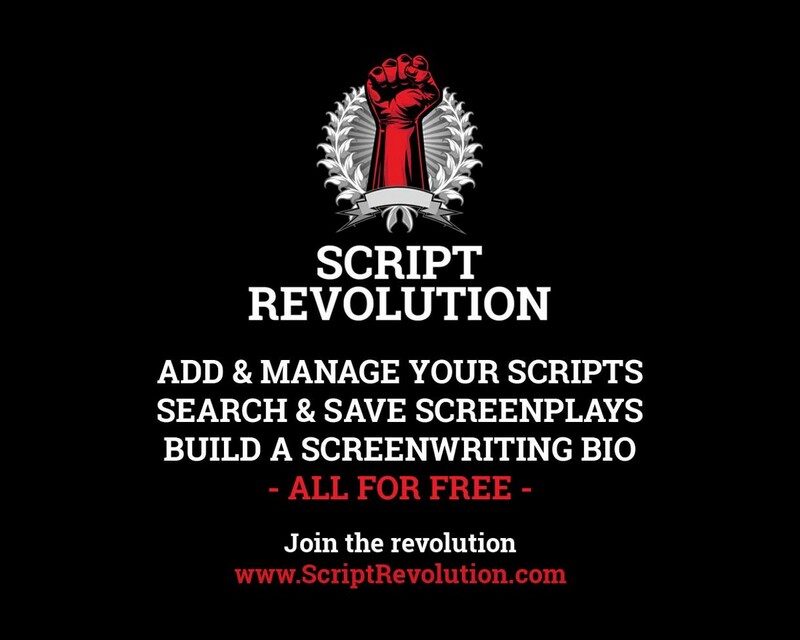 Inspired by the efforts of SimplyScripts, which has helped so many writers and filmmakers find one-another, Script Revolution hopes to bring another avenue of opportunity. 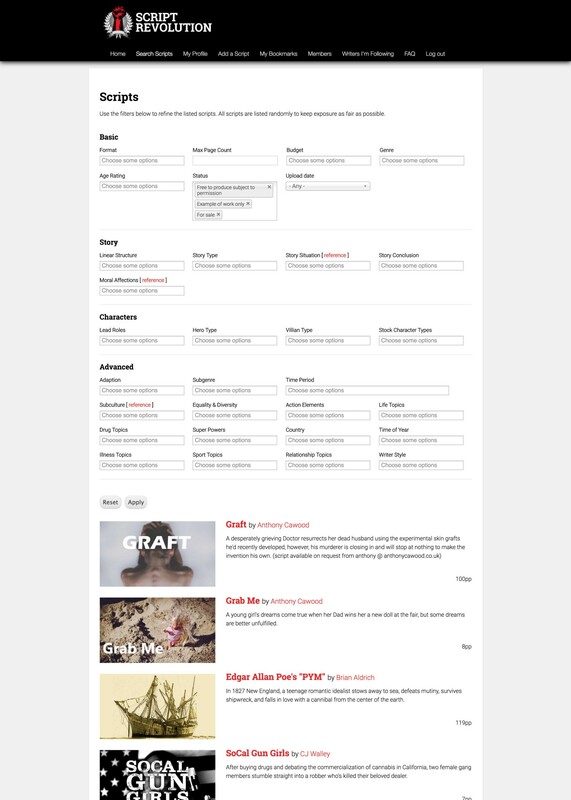 Once signed up, members can upload short, tv, web series, or movie scripts and add a variety of tags which help describe the nature of the material — we’re not just talking genre here, we’re talking budget, story structure, lead role genders, writer style, and much more. Filmmakers can then search the database using those filters to find exactly the type of script they are looking for. That’s the thing you see, the ethos at Script Revolution is all about discovery rather than promotion. Listings are all random so there’s nobody paying their way to the top, soliciting votes, or using any tricks to get ahead of others. Readers don’t need to sign up to anything and don’t have to be part of an exclusive club to access scripts. They can also bookmark all the scripts they like the look of ready to come back and read at a later date and follow their favourite writers. There’s no clique or elitism here — all scripts and all readers are considered equal. Script detail pages also include the writer’s bio with links to their social media accounts and a contact form that sends messages direct to their email — very useful for those who only want to upload their loglines and handle read requests themselves. In addition to that, all the writer’s other scripts are also listed. If someone loves your writing, they are exposed to all your writing. This ultimately means writers can build up their own profile pages, with a link they can share, introducing themselves, providing their contact details, and listing their scripts ready to read.